Elina Svitolina is one of the best Ukrainian and world tennis players at the moment. She is the winner of 12 WTA singles titles. In her career, she managed to gain victories over the most well-known players in the world and reached her highest WTA ranking, #3, in September 2017. Elina Svitolina was born on September 12, 1994, in Odessa, Ukraine, in the family of former wrestler Mikhaylo and former competitive rower Olena. She started to practice tennis at the age of 5, being inspired by her elder brother Yulian. At the age of 13, Elina moved to Kharkiv, where her career started to develop pretty fast. At the junior level, Svitolina won 2010 French Open girls event, beating Ons Jabeur in the final. She reached the finals of 2012 Wimbledon, but lost to Eugenie Bouchard. The same year, she won the WTA 125K Royal Indian Open. In 2013, Elina Svitolina won her first WTA title at the Baku Cup, becoming the first teenager to do that since 2012. In 2014, at the Australia Open, she managed to gain a victory over 2-time Grand Slam champion Svetlana Kuznetsova, but lost in the third round to Sloane Stephens. The same year, she defended her Baku Cup title. Moreover, at the Western & Southern Open, Elina marked the first top-ten victory in her career by beating Petra Kvitova as well as got to the quarterfinal at Premier-5 level. In 2015, the tennis player reached the semifinals at the Brisbane International and Copa Colsanitas, quarterfinals of the French Open, Western & Southern Open. She won Grand Prix SAR La Princesse Lalla Meryem. In 2016, the Ukrainian won the Malaysian Open. 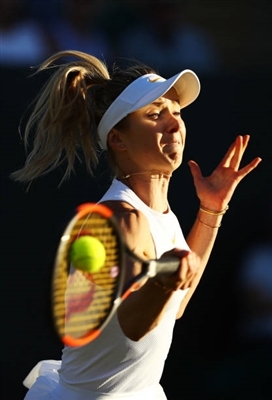 Svitolina reached the final at WTA Elite Trophy and took part in semifinals at Dubai Tennis Championship, Toray Pan Pacific Open, China Open and Kremlin Cup. Also, in 2016, Elina gained one of the biggest victories in her career over former world #1 Caroline Wozniacki. Participating in 2016 Olympic Games, she beat the defending champion, Serena Williams, in the third round, but later lost to Petra Kvitova. In 2017, Elina Svitolina reached the semifinals at the Brisbane International after beating world #1 Angelique Kerber. She won the Dubai Tennis Championship, her first title at Premier 5 level, and continued with winning two more Premier 5 titles: Italian Open (beating Simona Halep in the final) and Rogers Cup (defeating Venus Williams, Garbine Muguruza, Simona Halep and Caroline Wozniacki on her way to the title). Moreover, the player was a winner of the Taiwan Open and Istanbul Cup. In the beginning of 2018 season, the Ukrainian tennis player gained the Brisbane International title. After getting to the Australian Open quarterfinal, Elina defended her title at Dubai Tennis Championship and Italian Open, winning over Daria Kasatkina and Simona Halep in the final matches.